Pivot table is an important feature of Excel, which allows you to manage and summarize your large worksheet data. In this article, we will discuss how to group and ungroup of Excel pivot table data. Pivot table is an important and useful tool for data analysis in Excel. Pivot table is an important and powerful feature of Microsoft Excel. A pivot table allows you to easily arrange and summarize complex data. 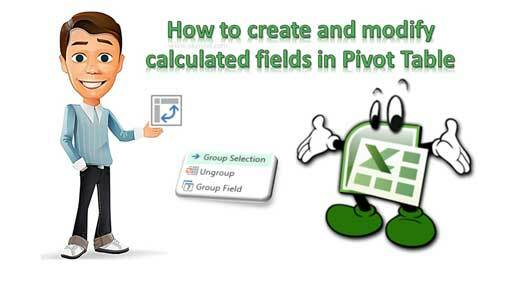 Sometime you need to create and modify calculated fields in Pivot Table. This feature provide more power to your active pivot table. Grouping data in a PivotTable helps you to show a subset of data to analysis. You can easily group row wise or columns wise Excel pivot table data. You can start grouping into Seconds, Minutes, Hours, Days, Months, Quarters and Years. If you don’t want to keep grouping of pivot table data, then you have to follow given steps to ungrouping of Excel pivot table data. During working on workbook you have to face duplicate values, records problem lot of time. To find duplicates you must have to use different methods. In this guide we have to discuss an easy way which allows you to find duplicates with pivot table in Excel. Excel allows you to find duplicate values of one or more columns. If you have large worksheet data in that situation it is not so easy to find out duplicate data. If you know about the pivot table utility in Excel then you can easily search duplicate values with pivot table in Excel. MS Excel is a huge ocean in which you will learn day to day new more tips and tricks. Today we discuss Count values in MIS report PivotTable. After reading this article you will be able to know how to count values in the matched range of cells using the PivotTable in MS Excel. This question is mostly asked by the HR Manager when you are facing the interview session for preparing MIS reports in MS Excel.